Today we went shopping. Well, not really. We actually didn't buy what we set out to buy. 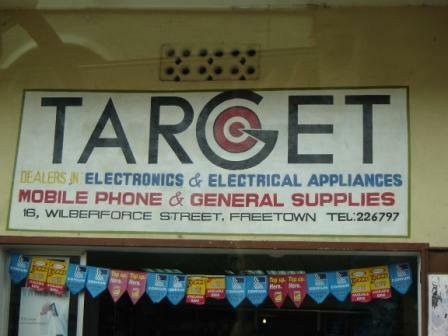 And just so you know, shopping in Freetown isn't quite like shopping in the West. 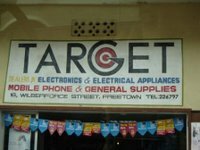 The store names might make you think otherwise but it's really not the same. 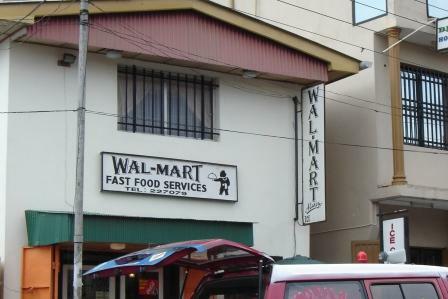 Walmart is a fastfood service and Target is an electronic store. I guess they have big hopes that the chain names will bring success! Well, to expats it's rather disappointing when one is in the mood to shop. When we go shopping- it's either at the "Big Market" or at a few fabric shops or at one of the smallish Lebanese run supermarkets. This morning we went to the “Big Market”; a huge warehouse where locals sell fabric, wood carvings, baskets, necklaces and other souvenirs. The reason we went was to pick up table cloths that we had pre-ordered over a month ago. Well, surprise surprise they were not finished. Actually they were still non-existent. Apparently business in the rainy season is so bad that the vendors can’t take huge orders (read: 12 table cloths) without having a cash deposit. Why weren’t we told that a month ago? After leaving the market we went to “Crown Bakery”. Definitely an expat hangout as most locals can’t afford the expensive commodities. I was really looking forward to their fried chicken. However, upon entering the café, there was no chicken in sight and I remembered that a few months ago the government had put a ban on importing chicken due to the bird flu scare. Too bad for me. I settled for a not-so-expensive plate of French fries (which I could have gotten anywhere I guess). Later in the afternoon 4 of us headed out to Lumley beach to sit, swim, read, talk. A relaxing afternoon once again. Fortunately it stayed dry so we could soak in the sun and enjoy the sea breeze. Needless to say it was an enjoyable Saturday, even though I didn’t get my fried chicken and it wasn't a shopping spree at Walmart! Thanks for the memories of the Crown Bakery and their pastries. Would love to come over and have some. What about the drive through Wal*Mart. We always referred to the vendors along the road as the drive through Wal*Mart. You can always and come shop here.